Our two boys are completely obsessed with dinosaurs and recently created their own La Brea tar pit in the flower bed, so this July I thought I’d channel their paleontology interests into slightly cleaner activities (they were so covered in mud after the impromptu tar pit episode that no skin could be seen on their arms and legs and every one of their toy dinosaurs had ‘fallen in’ and been covered in wet mud). Two of these activities were big hits, kept them occupied for a long time and didn’t require too much prep or clean up on my part. You do need to plan this a day or so in advance, but it’s pretty simple to do. Just fill a plastic bucket with water, add some plastic dinosaurs and freeze. 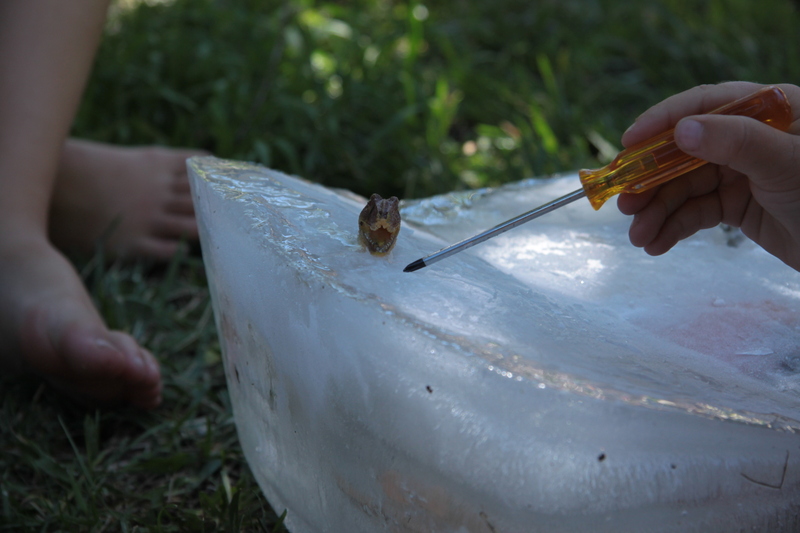 The next day, dump the dino filled ice cube on the lawn, give them some tools to chip away at the ice and invite them to be paleontologists. The boys had great fun excavating the dinosaurs and then experimenting with the left over chunks of ice. One note of warning–the freezing process can make the dinosaurs a bit brittle. Ours survived the process without real damage, but I wouldn’t use any favourite dinosaur models just in case. This was a two-day activity. On day one we made our plastic dinosaurs into fossils. The boys had great fun making the fossil mixture in their play kitchen in the garden. 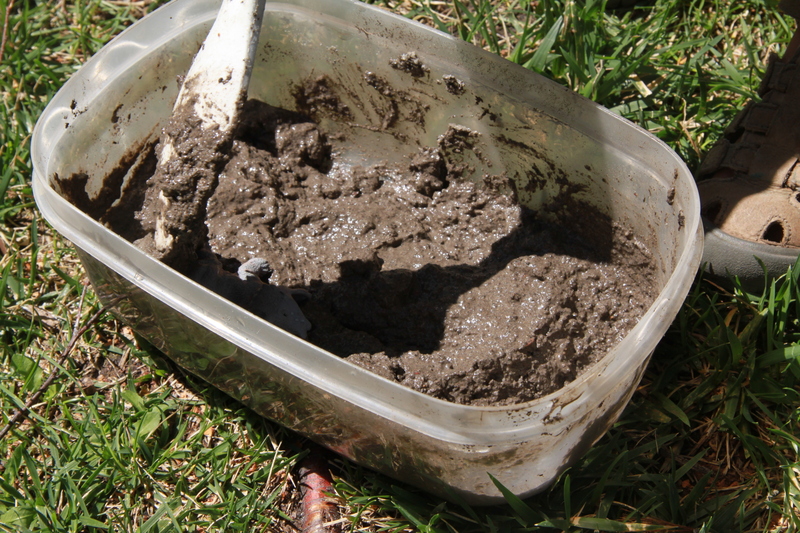 We mixed 1 cup of water, 1 cup of soil, 1/2 cup of sand and 1/3 cup of flour together in a bowl. 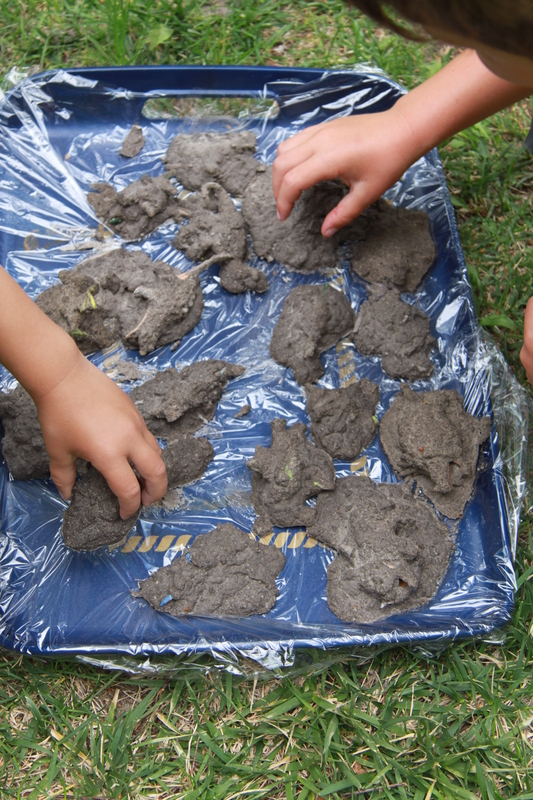 We then added the dinosaurs and covered them in this dirt goop before fishing each one out and laying them on a (plastic film covered) tray to dry in the sun. Twenty four hours later the fossils were dry and the boys were able to play paleontologists and excavate each dinosaur. Again, the dinosaurs can get a little banged up as the kids chip the dirt away so I wouldn’t use any beloved models (we kept our “special Allosaurus” on one side to watch). The boys were at a loose end in the garden for a while today. 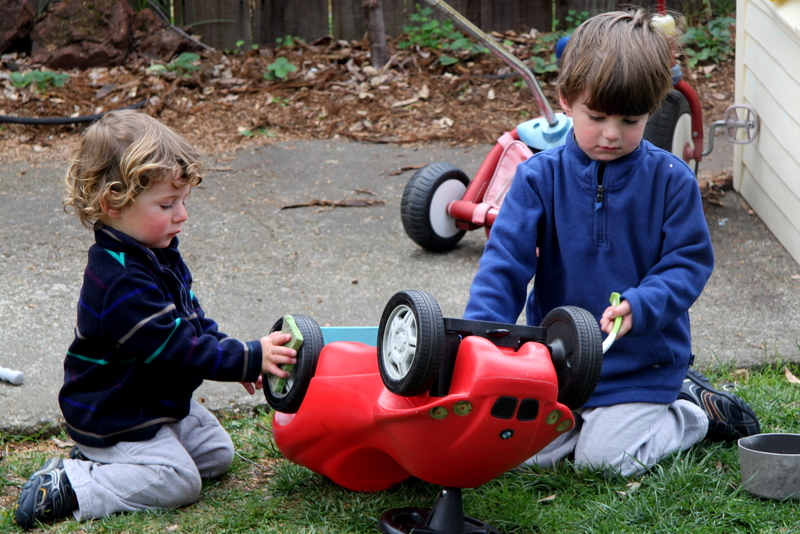 They gathered up their ride-on cars, a bucket of water and brushes and set up a car wash. I think it’s a great idea and, once the weather warms up, we may expand the car wash. Sometimes I have to work hard to remind myself how different the world looks to my toddlers. They’re often intrigued by things I would never have thought about. The bushes at the end of the garden are a good example. Now these bushes are especially big and, well, bushy and have been a source of fascination and anxiety for The Monkey ever since we moved in. They’ve long remained unexplored territory, however, and he’s been happy to inspect them from a safe distance. 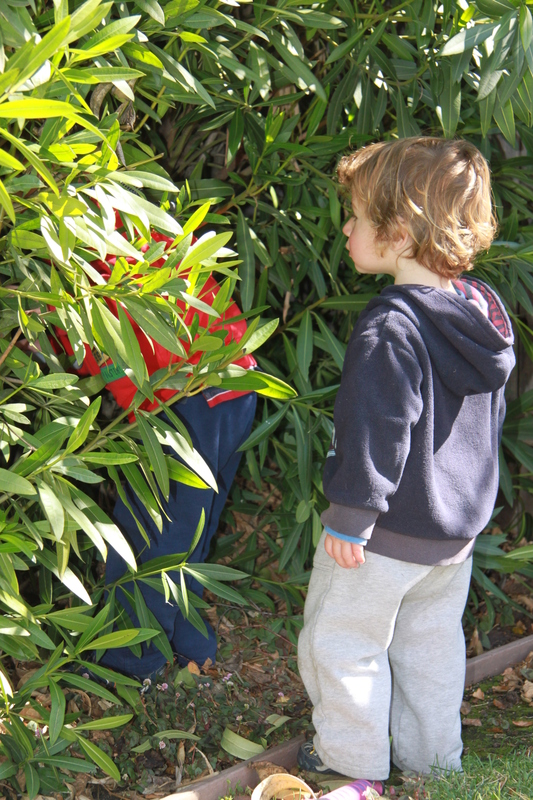 If his ball went behind them, he needed Mommy or Daddy to venture back among the leaves to retrieve it. But no longer. 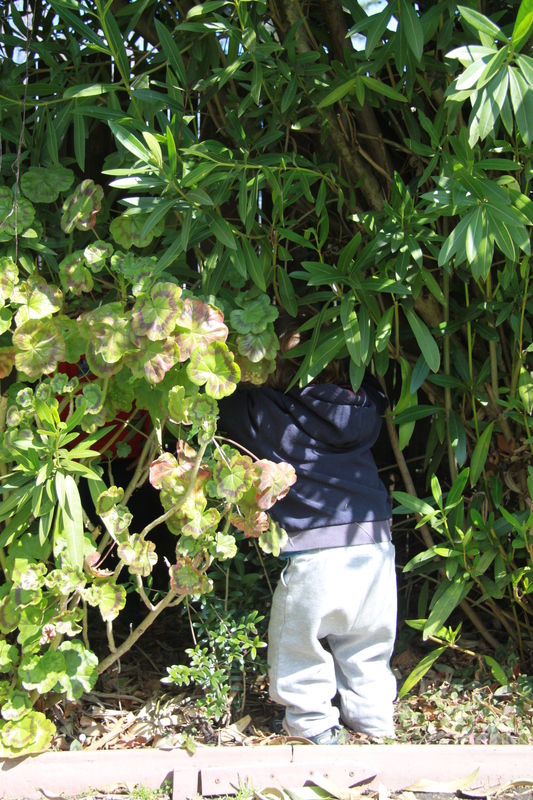 Today was the day The Monkey explored the bushes. When his ball went back there this morning, instead of running to me and asking for help, he slowly crawled in among the leaves. He was very excited by his own bravery and delighted to find a hidden path and shady hiding places between the bushes and the fence. The Monkey spent the whole morning exploring, gradually enticing The Puppy Dog, who is rarely daunted by anything, to join him. To me, they’re just bushes. To the little ones, they’re a whole world to be explored where daring and independence can be tested and adventures enjoyed.